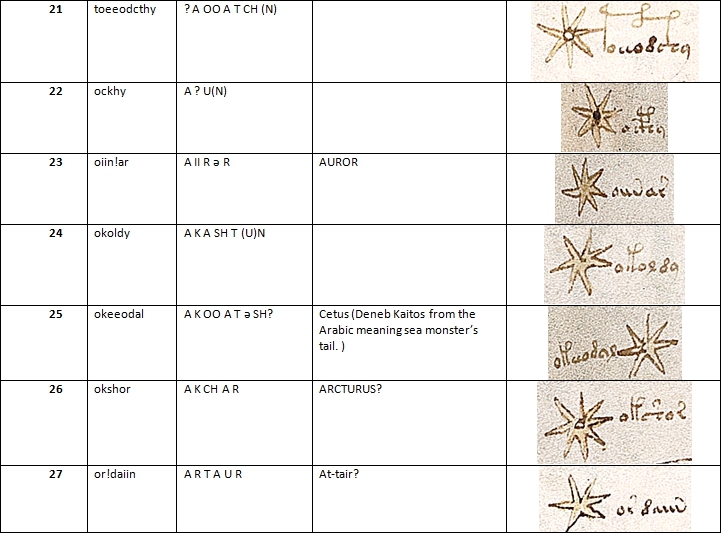 Here is folio 68r1 of the Voynich manuscript with my numeration, to help the analysis and discussion of possible star names. Comments welcome. Here is a list of the 29 star names represented on F68r1. A recent post here reminded me that I had never found a fit that I liked much for star 24. There was some similarity with Latin & Greek “Arcturus”, but not compellingly close; I just left it there because it was consistent with the better matches around it and not clearly unacceptable itself. It still bugged me any time I was reminded of it, because it was just about the weakest link on the page, but I guess it must not have crossed my mind since I started using Indic words in folio 68r, because I didn’t look for an Indic alternative for star 24… until now. The pattern with Indic labels on this sky map other than for the Indian North Star (Abʰaya) has been that the matching words are not proper names from either Vedic or Euro-Perso-Arabic astrology; they are ordinary Indic words for what the constellations represent in Euro-Perso-Arabic tradition: “horses” (Pegasus & Equuleus), “hero” (Hercules), “snake-charmer” (Ophiuchus), “reptile/snake” (Scorpio), “wolf/hyena” (Lupus), “circle” (Corona), “vulture” (Aquila). So if there is an Indic match for star 24, it would presumably also be not another proper name but a word for whatever that constellation represents. By star 24’s place in the map, the star still should indicate Arcturus/Boötes, even without any phonetic connection to either of those names. The character is a guardian/protector, watching the Ursa constellations to defend against the bears. “Guardian” or “protector” is रक्षक in Sanskrit, Marathi, Nepali, and Hindi, pronounced “rakʂaka” in the first three and “rakʂak” in Hindi because of Hindi’s usual terminal-vowel-dropping. The same word also ends up as রক্ষক “rokʂoko” in Bengali with the standard Bengali “a→o” shift, and as رکشک “rkšk” in Urdu with the vowels unwritten and using the same letter for /ʂ/ as for /š/. Its Romany equivalent is “arakʰári”. They all have the same root, originally “rakʂ”, meaning “protect, guard, keep, look after, defend”; Romany has added the initial /a/, lost the final /ʂ/, and replaced the suffix. That gives a much better phonetic match for ^ãkãštn^ or ^ãkaštn^ than was known before while still fitting into (even being predicted from) the same general theories. There is also the Nepali word for “crab”, गंगटा “gaŋgaʈā”, but I see nothing else that seems to be related to it. There isn’t any rule against part of a root word ending up resembling part of a suffix; for example, when PIE kʷekʷlo (kʷekʷlos with a particular common suffix attached) ended up as Latin “circulus”, it looked & sounded like it had the Latin suffix “-ulus” at the end. Latin speakers even back-formed “circ-” out of it and applied other suffixes to that as if the “ul” had never been part of the original root word, like “circus”, “circa”, “circum”, and “circuitus”. But things like that, while not impossible, are uncommon, so it’s normally best to presume that’s not what happened unless you have specific direct evidence of it. And that makes the following solutions seem less likely than the first one I mentioned here. Rereading some Scorpius information with those Indic words in mind, I believe I’ve found some more support for the first interpretation I described above, from Sanskrit अग “aga”, enough to safely discard the the numbered alternatives I listed after it. It not only is the simplest phonetic match with Voynich ^agahotn^ (because it doesn’t touch the apparent suffix ^hotn^ and the /g/ is a plain /g/ not an aspirated /gʰ/), but also turns out to have the most directly applicable meaning. It had been nagging me that the Sanskrit word अग “aga” means “snake” but most references to the Scorpius animal don’t say “snake”. Lizards, dragons, and generic monsters/beasts can sometimes take the form of a giant powerful snake or be called by the same word as snakes (such as old English “wyrm” for “dragon”, the same word as for snakes and worms), but their names alone don’t specify a serpentine body in most cases. Even this Indic word is an example of a crossover, evolving in meaning to the general “reptile” in Bengali while the meaning remained “snake” in Hindi. But I didn’t like putting a word that’s mostly pretty specific to snakes in a place where a word for a probably-four-legged “monster” usually goes. So I rechecked Hinckley on Scorpius, focusing on exactly where each particular description had come from: which references had specified a snake, which merely allowed it in generic form, and which had excluded it. There were two that had specified that this constellation is a snake. One was from ancient Egypt and doesn’t seem to have carried over into later traditions. But the other was Jewish: Scorpius was apparently drawn as a snake (with a crown) on the paraphernalia of the tribe of Dan, whose tribal emblem was also a snake. So, whatever the Voynich suffix ^hotn^ might mean, the root word ^aga^ that it’s attached to works perfectly as an Indic-language label for a Jewish image… which would sound like a strange and unlikely combination, if not for its consistency with other stuff I’ve noticed before about the Indic-like aspects of the language (both voiced and unvoiced aspirated plosives, two or more kinds of “r”, /x/ treated like an imported foreign variation on /h/) and the high rate of Hebrew word-matches for other stars on 68r. Derek – a fascinating article! The horned viper or “crowned snake” that you refer to is also known as a basilisk, a mythical creature. According to wikipedia, it is mentioned in both Roman-era natural history texts, medieval astrology and Old Testament biblical texts. Derek, re your comment of January 4th., 2016. According to Roy Pinney (and, if I recall, The Interpreter’s Dictionary of the Bible, though I do not that here), the horned serpent (Cerastes cerastes) is the reptile referred to in Gen. 49:17; Job 20:16 and Acts 28:3. It has a long presence in traditions of the eastern Mediterranean, most especially in Egypt but also and Syria. It was thought by one scholar to be that ‘asp’ by which Cleopatra died. In English translations of the Hebrew, the word is variously rendered as viper or adder or asp. The horned serpent was so significant in ancient Egypt that it was adopted as the sign ‘f’ and also represented the idea of the divinity, from an old equation between the potency of serpent’s venom and the power of generation. Its form was once seen in the stars we now identify as Canis Major, Sirius ( alpha Canis majoris) being its brightest star. Other names for Sirius can be found in Hinkley Allen but – as always – I suggest cross- referencing with Otto Neugebauer’s works and others. Hinkley Allen is a marvellous reference for English-speakers, but errs on some points, particularly “Arab” star-names. Neugebauer used regularly to become quite cross about it, and perhaps Paul Kunitsch too, because in 2007 he published an alternative: A Dictionary of Modern Star Names: A Short Guide to 254 Star Names and Their Derivations. I find Neugebauer more conservative than the evidence warrants on many points, and much prefer the Kunitzsch – not just that dictionary but his publications through Brill, and various papers (now available in a Variorum edition). Anyway, I hope some of this is useful to you. It’s easy to find imagery representing the tribe of Dan with a snake (sometimes carried by an eagle, thus also sometimes just the eagle). That link seems to be in no doubt, based on not only the abundance of related images to be found online but also the tribe’s Wikipedia page and the Genesis quote I quoted before. The challenge is verifying or refuting or at least contradicting the idea of Scorpius being a third point connected with the other two: either as a snake or in association with the tribe of Dan. That would be something I never heard of before I bumped into it on Hinckley’s page on Scorpius, and that particular sentence there doesn’t specify the source of that particular detail. If Scorpius really was ever seen by anybody as a snake and/or a symbol of the tribe of Dan, there should be other people saying so. 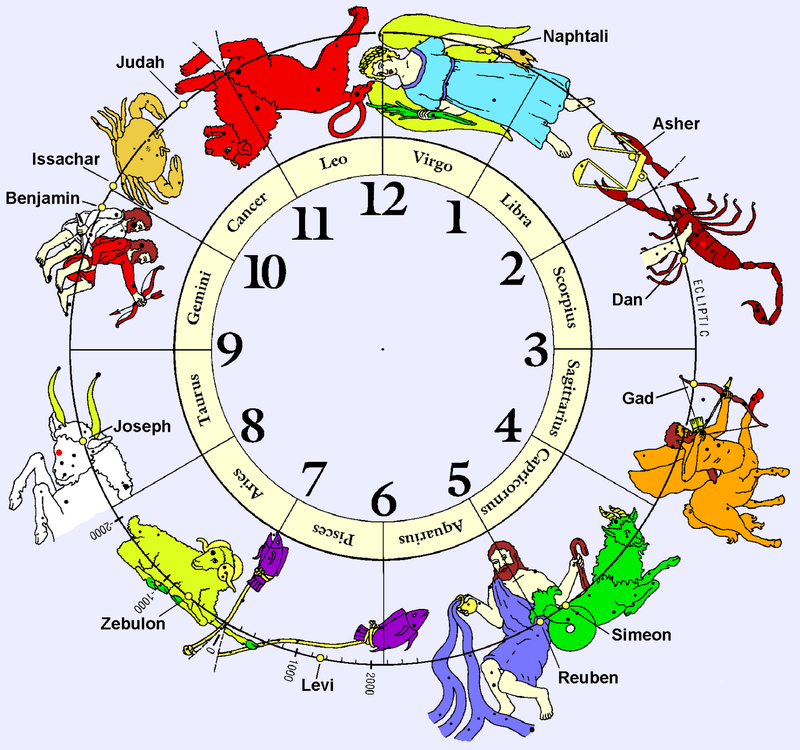 So I did some image searches for Hebrew/Jewish Zodiac/astrology to see if they used pictures of different animals & objects instead of the twelve we now know as standard, or labeled them with tribal names, or both, and if so, then what picture or label Scorpius would have. And there are indeed some other places to find Scorpius as either a snake or a Tribe of Dan representation or both. For example, this page says “Samson was of the tribe of Dan which was assigned to Scorpio” and “Samson, the Danite (tribal Zodiac Sign Scorpio)…”, and this one has each of the twelve tribe names associated with one of the twelve Zodiac symbols, including Dan with the conventional symbol for Scorpius (♏). They both also give some astrological and religious ideas of their own which I do not take seriously, but they both treat this part as not not their own invention but agreed-upon background information. The latter links to this page as a source, which oddly says “Dan is definitely established as representing Scorpio in Jacob’s last blessing, when he said: “Dan is a snake, a serpent in the path, that biteth at the horse’s heels so that the rider falleth backward,” referring to Scorpio…”, as if it were obvious that a verse saying that about a snake clearly must refer to Scorpio. I also found a few images like this one that show Scorpius’s place in the Zodiac circle occupied by an arthropod, but labeled “Dan”, the tribe whose emblem is well known to be a snake in most other contexts. So, although I still don’t know exactly where this general idea of Scorpius being associated with the tribe of Dan or a snake came from, it at least appears to have been floating around out there for a while. However, I should also point out that there’s roughly as much reason to link the tribe of Dan not with Scorpius but with Libra. For example, this image on this page shows Scorpius’s symbol (♏) with the tribe of Simeon, while Dan gets the symbol for Libra (♎). That page might be even worse than average about asserting the author’s own personal astrological zaniness, but it’s far from alone in this particular image-association. 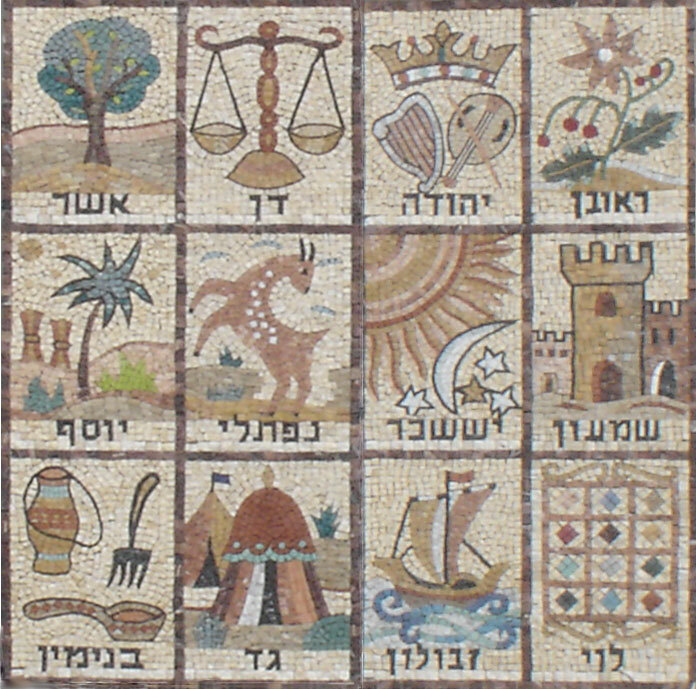 For example, Wikipedia’s page on “Israelites” shows this mosaic of tribal emblems, in which the one labeled “Dan” (דן; “dn”) clearly shows a balance/scales, and the Genesis verse I quoted before is immediately preceded by one about the tribe of Dan being judges and bringing justice. These are not necessarily astrological references to Libra, but, if one were putting Jewish tribal symbols into an astrological context, Libra would be the obvious one to assign to a tribe that’s elsewhere represented by scales and described as “judges”. But there is a simple reconciliation of these two concepts. The Wikipedia page on the tribe of Dan says the snake and balance symbols have both been used, just in different historical eras: “Modern artists use the “scales of justice” to represent the Tribe of Dan due to Genesis 49:16 referencing Dan “shall achieve justice for his kindred”. However, more traditional artists use a snake to represent Dan, based on Genesis 49:17″. If any two methods of roughly equally dividing a year into 12 segments are not synchronized, then each month in one system will overlap two consecutive months in the other system, and Libra and Scorpius are consecutive, so the Hebrew month of Dan can overlap both of them. The Bible’s two consecutive verses can even be interpreted as referring to exactly that combination. So, why do I stick with one symbol for this tribe as relevant to Voynich star 28, and discard the other? Phonetics. Going by positions on the page, 28 should be Scorpius and 29 should be Libra. If we detach ^hotn^ from both as just a suffix, star 28 is left as ^aga^ and star 29 is left as ^tãš,tãs^ (potentially ^tãz^ based on some other instances of Voynich ^š,s^ correlating with “z”). The former perfectly matches the Sanskrit word for “snake” which led me to this in the first place (अग) , and the latter is similar to Persian ترازو “trazw” (Tarāzū) for “scales, Libra”. Also, the latter connection was already independently made long before anything about the tribe of Dan was even noticed or considered in this context, and doesn’t rely on any such connection to work. The idea that Scorpius was once a Dan symbol/snake to the Voynich people, as it evidently was to at least some Jews, also fits with what I’ve said before about star 21, replacing the snake-handling healer Ophiuchus with a snake-charmer (Marathi गारुडी, “gāruɖī”; Voynich ^gaõoãtjn^). Scorpius, Ophiuchus, and Serpens are all right next to each other and often depicted as one scene with Ophiuchus interacting with both animals. But there are no images of Ophiuchus with two snakes, and snake-charmers are often seen with two snakes. Also, the eagle-god Garuɖa, after whom I presume snake-charmers were named in Marathi, was famous for killing not one snake but many. 1. The word ^aga^ had already shifted meaning from Sanskrit “snake” to something like “monster” or at least “reptile” before getting attached to the constellation (which did happen in Bengali but not most other Indic languages). 2. The word ^aga^ first got attached to the constellation while it still meant “snake”, then later either shifted meaning to include other reptiles/monsters or fell out of general use and was reduced to nothing but a name for the constellation, while the people’s mental image of the animal grew legs. An Indic-language reconsidered of an “old” case that’s always still bugged me: Hercules, star 20. The closest thing I could originally find to a match for the Voynich name ^nkhtn^ was Greek “Engonasi(n)”, but that was always just about the weakest case that I had bothered to say anything about here. It has /g/ where the Voynich word has ^k^, no real counterpart for the Voynich ^h^ unless you count /o/, and very little similarity after that except that /s/, /t/, and /n/ are all in the alveolar position, and even that’s using the Voynich suffix ^tn^ or ^htn^ as part of the match instead of matching just the part before the suffixes. I just couldn’t find anything better. Once again, Indic languages have just yielded better phonetic matches for a word for which the closest I could get before just hadn’t felt as close as it should be. Interpreting Ophiuchus, *21 ^gaõoãtjn^, as a snake charmer charming the two snake constellations near him (Serpens and a reptilian Scorpio) created a bit of an oddity for nearby Aquila, *17 ^aghta^. The Marathi word for “snake-chamer”, गारुडी “gāruɖī”, seems to be based on the name of a snake-killing eagle-god, गरुड “Garuɖa”, the cognates of which, in other Indic languages, are either still that god’s name, or even just the word for “eagle”, the latter of which also makes it the name of the constellation Aquila today with the adoption of western astrological concepts. But Aquila is not Ophiuchus; it’s a neighboring constellation. It’s easy to figure that, at the time of the creation of the Voynich Manuscript, a group of Indic-language speakers who had recently arrived in Europe from the Middle East would not yet have applied that word to Aquila, which had not been figured as an eagle in India. (It seems to have been Vishnu or a fig tree.) But in that case, what would they have done with Aquila instead? It would be weird to have two constellations right next to each other related to eagles, but not at all unusual to interpret Aquila as not necessarily an eagle. Carnivorous birds’ names tend to cross over with each other or simply lack distinction from each other in various languages, and this constellation has been named after different languages’ words for not just “eagle” but also “vulture”, “falcon”, and simply “bird”, but mostly “vulture”. In Hebrew, “vulture” and “eagle” are the same word: עַיִט, originally “ʕayitˤ”, which later shifted to “gayit” or “ŋayit”. Do you include Tamil in your range of comparisons? If so, have those terms proven a poor match? It’s the same for *38 as “circle/wheel” (Corona), *36 as “flow/current/stream” (Fluvius/Eridanus), *21 as “snake-charmer” (Ophiuchus), *45 as “wolf” (Lupus), and *53 as “cup/bowl/goblet/pitcher/jug/urn” (Crater), along with a collection of plants. I can find matches for Voynich words in Indic languages, Semitic languages, Persian, Greek, or Latin, but not the Dravidian family (or Turkic, or most of Indo-European, or others). If there is a way to get Dravidian words to match Voynich words, it must be with some other Voynich phonetic system, not the one I have. I would be glad to know if you’ve found any reliable history of this practice of associating the twelve tribes with the signs of the Roman zodiac, since I had no luck on that, myself. “..we find designations in the Old Testament for only six constellations, which would come to be identified, more or less plausibly, with the following: Ursa Major, Ursa minor, the Hyades with Aldebaran, Orion, and the Pleiades, and the so-called “chambers of the south”. – Astronomy in the Old Testament. It’s an old book (1905) but still the standard reference for this subject. The northern tribes were deported by the Assyrians in the 8thC BC. The Romans’ 12 figure zodiac wasn’t conceived, or at least formally established, until about the 2ndC AD. or else its an invention of some earlier Christian theologians, commenting on the biblical text. It wouldn’t be the first time that an idea originating in that way became so widespread that it fed back into Jewish custom. But I wasn’t able to find certainly when or where it began. Have you a date for the mosaic you linked to? I don’t know of any dates for the full Zodiac circles I’ve seen with Hebrew tribal names on them. Nor do I know of a date for that mosaic, which I note uses distinctly non-Zodiac symbols in most cases. I suspect the idea of associating each tribe with a Zodiac sign is too recent, and not sufficiently mainstream in Judaism, to have influenced the Voynich Manuscript. However, my theory about star 28 ^agahotn^ representing Scorpio as a snake and having an Indic word for “snake” as the ^aga^ in the star’s label is more limited in scope than that. Its validity would not be affected by the lack of a complete 12-section wheel like that at the time the manuscript was written. All it really needs is that there were some people, who could plausibly have influenced the Voynich Manuscript, who figured that constellation as a snake. And it turned out that there were, and they were Jews, which was consistent with other hints of Jewish ideas in the manuscript, including some other star labels. The specificity to the tribe of Dan seemed noteworthy & interesting but is also fairly ancillary, and it does not necessarily imply that other tribes need to have been associated with any other constellations yet. Interesting to see that the evidence of the imagery in regard to Jewish influence seems to be reflected in your translation of the inscriptions of the calendar. 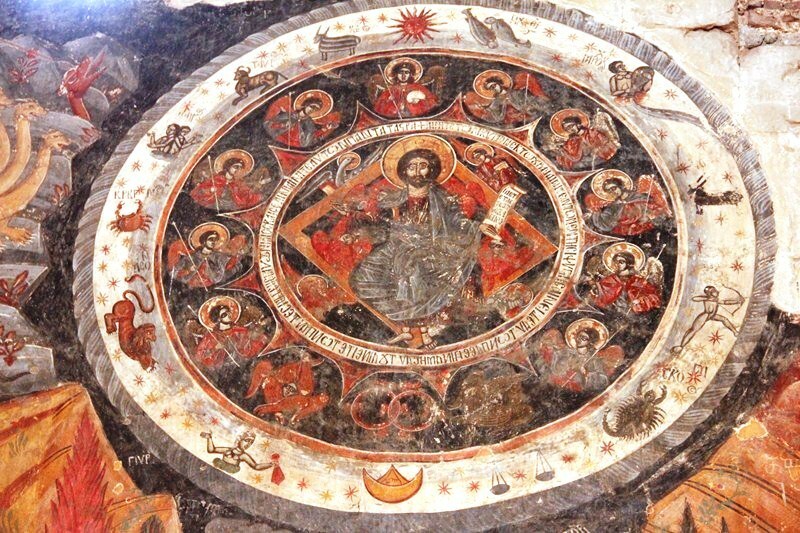 Here are a few examples of Christian Orthodox zodiac frescoes in which the Sun and the Moon, opposite to each other, respectively mark the Spring and Autumn equinoxes. I think it’s interesting that this tradition is in agreement with some of the assumptions that have been made in these pages. * Church of Ag. Ioannis, Platsa, Greece the church dates to the 12th Century. The fresco is damaged and the Autumn equinox area is lost. * Svetitskhoveli Cathedral, Mtskheta, Georgia different sources give different dates for this fresco: 13th-17th Century (English wikipedia). * Dekoulou Monastery, Greece 1765. * Agia Thodoroi, Peloponnese, Greece (I could not find a dating and exact location). This image shows minor changes I’ve mentioned before on stars 26, 38, and 45, but the big important things it shows are the cognates for previously cognateless stars: 16 (as suggested by Marco P) and 21. Equuleus/Equus is sometimes translated as “the foal” (juvenile horse), but sometimes as “the horse”. Pegasus has sometimes been drawn without wings and also called “the horse”. Because they are right next to each other, they have also been treated as one constellation called “the horses” in various languages. In Urdu, that comes out as گھوڑون , “ghwṟwn”. I have recently been collecting the words containing ^h^ and ^x^ for a closer look at how Voynichese handled the family of sounds comparable to and including /h/ and /x/. One late (re-)discovery was in star 26. Although the name was rendered as “Unuk-Alhai” in one case, the equivalent of that [h] in the original Arabic word it came from was ح, not ه. So the original sound was not /h/ but something between that and /x/, either /ħ/ or /ʜ/ depending on dialect. The same letter & sound appear as an [H] with a dot below it, [Ḥ,ḥ], in star 52 in the image, conveniently equivalent to a rare sequence of both of these Voynichese letters together: ^xh^. The symbol “ḥ” collectively refers to /ħ/, /ʜ/, /χ/, and /x/, which are all possible manifestations of a Semitic sound type called “emphatic H”. I’ve combined two separate lines of thinking here about the few things at the top of this page’s drawing. One was the idea of trying to find relevant ordinary words in Semitic or Indo-Iranian languages to match f68r’s star names, instead of established star/constellation names. The other is that the top area of the circle, where it seems like Aries should be, is associated with the spring equinox, which was the beginning of the new year in many cultures. The idea was that one of the Voyinchese names near the drawing of the sun, even if the language’s speakers used it to refer to Aries, might refer not to the animal but to the event associated with the constellation. Several words related to spring, such as “sunlight”, “warm”, “cool”, “rain”, “summer”, “new year”, “dawn”, “early”, “green”, “birth”, “growth”, “young” and “life”, have been known to drift in meaning from one to another in various Indo-European languages, as if people have a tendency to use one of them as a metaphor for another and then the metaphors catch on. For example, our own “spring” is parallel to “fall”, both of which name a season after a verb for what leaves do at that time, and our “green” came from “grow/growth/growing”. Also, the Russian word for “spring” is a cognate of our “year”, and the Latin word for “spring” was also sometimes used to mean “youth”, ended up in Spanish as the word for “summer”, and had originally come from a PIE verb meaning “(to) live”. I tried several words at Google Translate in Arabic, Hebrew, Persian, and Urdu, and got nothing from the first few rounds such as “spring/springtime” and “green”. But I did get something interesting with “beginning”. In Hebrew, it’s either הַתחָלָה “hatxalah/hatxoloh”, or אַתְחָלָה , which is the same word with the initial letter He replaced with Alef, making the first part something like “aat” or “ʔat” or “at” instead of “hat”. Those seem fairly close to Voynich star #2, ^athojn^ (…espcially considering that /x/ is considered an “emphatic H” and can be transliterated as [kh] in modern Hebrew romanization or as [ḥ] in Semitic general compartive linguistics). Now consider that the beginning of one year is also the end of the previous year, some of the comparable cultures that have been mentioned here before are known for putting the same item at both the beginning and the end of a list if the list is perceived as cyclical, and there are two stars next to the sun symbol on f68r1. So I checked for the word “end” on a hunch that either it might be an even better phonetic match than “beginning” or a version of the same word, or they might even have marked the same constellation twice. And again, the only language that gave me a result that was close at all was Hebrew: קָצֶת “qa$et” or קֵצ “qe$” (standard modern romanization “katzet” and “ketz”), which aren’t too far off from #1 ^akatwsn^. There’s just one huge problem: The arrangement of these two words is the opposite of what it would need to be. With #1 as “end” and #2 as “beginning”, the implied direction of travel would be clockwise (summer on the right, winter on the left), but the order of the constellations is counterclockwise (summer on the left, winter on the right). I knew all along that this method was prone to false positives. But that only eliminates the two names together as “beginning” and “end”, not either one alone. I still think #2 is related to “beginning”. That just doesn’t help with #1 except by telling me that if there is a reference to Aries as an animal on this page, it isn’t #2, which narrows it down to #1. The simplest transliteration from Voynichese so far would be ^akawsn^. But ^w^, like the Semitic letter waw, is sometimes better rendered as [u], and ^a^, like the Semitic letter alef, sometimes equates to /e/ as well as /a/, particularly in Persian, which often has /e/ where Arabic cognates have /a/. On top of that, ^a^ also has repeatedly appeared in Voynichese words whose apparent cognates in other languages immediately follow that vowel sound with /L/ or /r/, a phenomenon which I’ve been representing with ^ã^. And a couple of words beginning with /fa,far/ in Arabic and /pe,per/ in Persian have appeared in Voynichese without the first consonant, just starting at ^a,ã^. The combination of these alternative ways of reading vowels, the possibility of /r/ hidden in ^ã^ as /ar/ or /er/, and the possibility of a dropped initial /p/ or /f/, all adds up to mean that this word’s counterparts in Arabic and Persian are likely to be “farkausn” and “perkeusn”. Based on surrounding constellation’s identifications, it looks like the only thing star #4 can be is Perseus. The Arabic and Persian names for “Perseus” are essentially just their phonetic transcriptions of his Greek name, with the first vowel unwritten: فرساوس “frsaus” and پرساوس “prseus”. That’s practically exactly identical the above interpretation of the label on Voynichese star #4, minus the suffix ^n^… except for the bizarre replacement of the first /s/ with /k/. I dont’ know how that would happen, so maybe it means this whole line of thinking is wrong, but I will point out that avoidance of repetition has been known to happen in other cases where an original word had the same consonant twice, such as the second /kʷ/ in PIE kʷinkʷe becoming /t/ in Latin quint- (“five”). And my earlier suggestions that the constellations Corona and Lupus on f68r2 could use Indo-Iranian words for “wheel/circle” and “wolf” also called for de-repetition of other repreated consonants, so if that applies in any one of these cases, that would increase the chances that it applies in the others and was a general trend in the evolution of Voynichese. The reversal is not a problem. It is quite common to see the skies represented in older works as if you looked down through the stars towards the earth. This in effect reverses the order, and appearance of the visible heavens. Both versions for the constellations are represented, as I’m sure you know, in the famous work by al-Sufi (among others). But the same happened earlier and in the west. The sky map can be depicted in either orientation, but whichever way it is, everything in it needs to be oriented the same way, not just parts. You could have summer on the left and winter on the right or summer on the right and winter on the left, but either way, if there’s a sign on spring saying “this way to summer”, it needs to actually point toward wherever summer is, not toward winter. So, with the constellations arranged as they are, the only way stars 2 and 1 can be “beginning” and “end” is if the virtual arrow they form goes counterclockwise, not clockwise; to go clockwise, they’d need to be on a map where all of the constellations were reversed from this one. Not necessarily. You are thinking from a western perspective, and a modern one. There are other ways of seeing. Just as example of an alternative, you might be amazed to hear that for the Egyptians, the world was stationary, and the heavens rolled over it, a bit like those globes which have the north-south axis laid ‘horizontally’. On that rolling-over sky, the sun occupied a stationary point, sort of a prime meridian which implies a division of the day-and-night by hours, and a total of 12 or 24, but not the 360 degree-divisions we refer to automatically. Here they correspond to South (“m[edium] dies”, path of the Sun – “corsus Solis” top) and North (“septentrio” marked “nox” – night- at the bottom). East is on the left (“oriens”) and West on the right (“occidends”). I currently think that this is the orientation of f68r3, by analogy with medieval horoscopes. About Star #4, Emilie Savage-Smith writes that, in the Smithsonian Globe, Perseus is labeled “Barsā’ūs” where the apostrophe is a ‘hamza’. If hamza could in this case be assimilated to the sound ^k^, we would get something like “barsakus”, rather similar to the “farkausn” you suggest? Something else I found about 1 and 2, on the Hinckley Pisces page: there is actually a point in the sky between Aries and part of Pisces, or apparently sometimes included within either of them, called the “First of Aries” because it’s the constellation’s leading edge, the first part of the constellation to rise again each year (and the first to set). This point would be a bit to the right on the page from the middle of the expected area of Aries, as Voynich star 2 is. So that means there is precedent for a word like “first” or “beginning” for a feature of that part of the sky, which I didn’t know when I found the word אַתְחָלָה “atḥoloh” for ^athojn^ based on a hypothesis about words associated with spring. Also, because it refers not just to the first constellation of a new year but also to the leading edge of that constellation, it means there are two ways we could read star 1’s label ^akatwsn^ as related to קָצֶת or קֵצ “katzet/ketz” meaning “end”: end of the year, or trailing edge of the constellation whose leading edge we already know has its own name. But that might not be necessary, in light of another possible reading for ^akãtwsn^. Apparently, it’s been common from India to at least as far west as the Euphrates River to depict Taurus as a zebu, an Indian breed with a hump on top of its shoulders & neck. That part of Taurus is roughly where star 1 is, and the Greek word for that part of the animal and its constellation was Κυρτός, “Kurtós”. In other posts elsewhere, I’ve described other names/words where ^n^ seemed to correlate with /m/ instead of /n/, and theorized that it should do so even before I had seen any examples. If we do that substitution one more time and read star 6 as ^ajõom^ instead of ^ajõon^, it’s easy to see it as related to “Andromeda”, and it is located appropriately for that. Another group of possibilities for 6 (using both /n/ and /m/) is Al Janāḥ, Al Janb, and Algemo, for Gamma Pegasi, at the tip of Pegasus’s wing, the closest part of Pegasus to Andromeda. 21 should be Ophiochus or another part of Serpens, and 28 should be Scorpius, but I have concluded that finding matching names for them is not within my present abilities. I find it interesting that the two hopeless unknowns are right next to each other, and, in the spherical sky, would also be near 45 (Lupus) and 38 (Corona) on f68r2, which I also could not find names for among the known historical names of constellations & stars in those areas. It means there’s probably a single phenomenon behind all four, some local independent remodeling of constellations in that part of the sky which single-handedly affected them all but was not recorded in history outside the Voynich Manuscript. That could even include star 16, ^aphoar^, which I dismissed long ago as a special individual case, unrelated to other names for the same object (Alpha, Beta, or Gamma Draconis) because it’s the center of the northern sky and could have just been referred to by a Voynichese word to that effect instead of by a name known to other languages. this paper by R. N. Iyengar is about “Dhruva, the Ancient Indian Pole Star”. The star in question corresponds to Alpha Draconis (Thuban). The author mentions another Vedic name for this star: Abhaya or Abhayam (“fearless”). Star #16 (EVA:ofcheor) reads something like apyoar (Stephen) or ^aphoar^ (your reading). I wonder if the Sanskrit “Abhaya” could be related? Two things did worry me a bit at first, but I checked on them and I’m sure they’re OK now. One was the description of the star being at the end of an animal’s tail, because that’s not the part of Draco I thought it would be. But there’s no need for the whole Indian constellation to have been the same as Draco, and the stuff about the other stars pivoting around it makes it quite clear that it’s not talking about a star in Draco’s tail. The other was that Sanskrit was a dead language by the time the Voynich Manuscript was written and the name might not have persisted in more recent languages. But the fact that it was translated as “fearless”, together with the fact that “a-” is a negating prefix in some Indo-European language families, implied that the rest of the word would be “fear” in Sanskrit, and so would something close to it in various related modern languages that I can use to test that kind of prediction. I found that “fear” is “bʰoyo” in Bengali, “baiya” in Sinhala, “bʰayam” in Malayalam, and “bʰaya” in Marathi, Kannada, Hindi, and Gujarati. I am glad you find the idea interesting! I am also confused by the nature of this Indian constellation. According to Iyengar’s paper, it is named Úiúumâra and represents a dolphin. Popular Hindu Astronomy calls the constellation Sisumara. The Vedic Index of Names and Subjects says that Sisumara is equivalent to Simsumara (crocodile). The star map in Popular Hindu Astronomy p.64 features a scaly beast with legs which possibly is closer to a crocodile than a dolphin (but not very good as any of the two). Marco – this identification is an important step, as Derek rightly comments. Derek’s comments about the VM being written long after Sanskrit ceased being a “living-language”, equally applies to Avestan. Since Avestan was a sacred language to the Zoroastrian/Parsi community, it continued to be used until much more recently. Its seems plausible that the VM could have some sacred/religious function. Derek – does Avestan share some some of phonetic qualities you refer to? I’m interested to know if there’s more of an Iranian or Indian influence going on here. By way of balance, the Kalasha language is thought to be most similar modern language to ancient Sanskrit. This is spoken in the mountainous areas of Pakistan. There seems to be Greek element to the VM too, perhaps an Greco-Bactrian origin (modern day Afghanistan) could explain these Greek/Iranian/Indian elements. 1. Retroflex sounds: A retroflex consonant is pronounced with the tongue curled back slightly behind the usual alveolar position we use most of the time for /d/, /t/, /s/, /z/, and /n/, so the roof of the mouth is touched by the tip/bottom of the tongue instead of the top. English speakers often retroflect our alveolars when there’s an adjacent /r/, but still think of them as functionally the same thing as the alveolar originals, so we also tend to hear other languages’ retroflexes as alveolars following or followed by /r/. In Aryan languages, there are separate alveolar and retroflex series, with their own letters in the Brahmic alphabets. Urdu uses a diacritical mark to distinguish them because it’s written in a version of the Arabic alphabet, which doesn’t have retroflex letters. Romanization of Aryan retroflexes is based on their nearest alveolar counterparts, with either a tail like an upside-down [r] or a dot added below (ɖ-ʈ-ʂ-ɳ-ḍ-ṭ-ṣ-ṇ), or, if that’s not an option, the letter can be doubled. In Iranian languages, the retroflexes are gone, having merged back into the alveolars. I do not see any way for the Voynichese alphabet to accommodate retroflexes without replacing some current sound assignments for other sounds that are nowhere near the same sounds at all, which would eliminate most of the potential cognates so far and leave those other sounds out of the alphabet. 2. “N”-like sounds: Aryan languages generally have four, with separate Brahmic letters for each: one alveolar like our “n”, one velar like our “ng”, one palatal/palatalized like Spanish “ñ”, and one retroflex. Iranian languages have just one or two, represented by one letter, like English. There’s apparently just one such letter in Voynichese. 3. Fricatives: Aryan languages have only /h/ and some sibilants. Proto-Iranian originally had those but then also converted aspirated plosives to fricatives, thus adding /f,ɸ/, /v,β/, /x/, /θ/, and possibly /ɣ/ and /ð/. I believe Voynichese had /h/, some sibilants, /f,ɸ/, /v,β/, /x/, and /ɣ/. 4. Aspirated plosives: Aryan languages have eight, ten when you include the aspirated affricates. Iranian languages have none. I’ve said before that Voynichese seems to have something we can equate to aspirated plosives elsewhere, but that doesn’t mean Voynichese had them itself. Writing a plosive letter followed by the letter for /h/ could be either Voynichese’s own way of spelling its own aspirated plosives, or an approximation of some other langauge’s aspirated plosives as heard by people whose language doesn’t have them. So the Voynichese plosive+^h^ pattern doesn’t point one way or the other by itself. 5. Aspirated plosives becoming fricatives: Not only does the Iranian branch lack several Aryan plosives and have several more fricatives that Aryan langauges lack, but also, both of those facts were caused by a single mechanism: the conversion of plosives to fricatives in Proto-Iranian. Unrelated occurences of the same kind of shift have also happened in Greek and Aramaic, so that by itself isn’t special. But what I think what is notewrothy is the confluence of that sound shift and how the sounds in question are written in my model of written Voynichese: by combining a plosive with ^h^ in some way (sequential in one case, overlapping in the other case). Although it’s obvious why someone might do that for an aspirated plosive, it seems far less automatic to me that a fricative would be spelled by adding /h/ to a plosive, because there’s no other reason to associate /h/ with fricatives in general unless you’ve already learned a spelling system that already has that quirk. If the Greek sound shift for [θ], [φ], and [χ] hadn’t gotten so many European language speakers used to the idea with Latin [th], [ph], and [ch], I suspect it would seem weirdly arbitrary and hard to believe. I can imagine myself, if I had even thought of it at all for Voynichese without that example, trying to describe the concept here and needing to awkwardly resort to far-less-familiar examples of a secondary articulation merging with a primary articulation, like Proto-Hellenic /gʷ/ becoming /b/. So, why would the same odd use of a letter for /h/ occur elsewhere? I expect it would be for the same reason as in the known precedent: because the people using the alphabet were, or had been, familiar with the language the sound shift happened in when it happened, as users of the Latin alphabet were familiar with Greek when Greek’s sounds shifted and afterward. Thus it would seem natural to represent the outcome of the shift (fricatives) with a written convention similar to the way the input would have been written (addition of the “h” letter). In Latvian “fear” is “bailes” (which now is used in plural form, but root would be just “baile”), and prefix “a-” is more related to “other/opposite/dual” than negation. The linked PDF gives the dates when Alpha Draconis would have been at or close to the celestial north pole (the point around which the rest of the northern sky rotates). It’s at least five times as long ago as the Voynich Manuscript was made. The simplest interpretation would be that it means either the identification is just wrong for a relatively young book or the Voynich Manuscript records ideas from long before it was made. Another alternative is that the name of what had once been the pole star was simply transferred at some time to the new pole star. Continuing the earlier discussion about a star name meaning fearless – there seems to be a similar word in Hebrew too, it means fear/reverance : bə·yir·’āh. Does this fit? Derek – could you expand a little more on the Indo-European languages that use an “a-” prefix to indicate negation? There’s been quite a lot of activity discussing the European influence in the VM recently, so I’m keen to understand how this might fit with the linguistic evidence. It has been remarked upon elsewhere that there does seems to be a Greek influence in the VM. Are there any other linguistic traits found in Greek that are also found in Voynichese? linguistic form a mix of Greek/Hebrew/Aramaic might take. The prefix “a-” for negation happens only in the Hellenic and Indo-Iranian branches of the Indo-European family. In both cases, its oldest attested form was “an-“. The “n” which was dropped in those branches was retained in the rest, such as English “un-” and Latin “in-” (which was later imported to English). 1. The star’s name needs to mean the opposite of what the root word means, which is what the prefix “a-” does in Aryan languages. That is consistent with the initial ^a^ at the beginning of the star label, but other IE and Semitic languages don’t have that prefix. So the Voynich word would have an extra component that the Hebrew word doesn’t explain, and would lack whatever Hebrew might use as a negator instead. 2. The idea of calling that star “fearless” in any language is an Indian idea, not a Semitic one. So even if there was a small, isolated community of Jews who called that star by such a name, they must have gotten it from India anyway. And then it would be just a name, not a word of their own language, with the prefixes & suffixes built in, like when we use “Sagittarius” in English. I do not believe Voynichese is Greek. It can only be Greek if I am wrong about the phonetics. Greek has too many distinct vowel phonemes, a distinct “L”, separate “n” and “m”, the same number of alveolar plosives & fricatives (t,θ,ð) as labial and velar ones (p,f,v;k,x,ɣ), only one simple thing to equate with “r”, no phoneme to connect with Voynich ^h^ or ^$^, a /x/ that isn’t related to the non-existent /h/, and no voiced aspirated plosives. Although there is a sort of parity between some of its plosives and fricatives, that’s because the former shifted to become the latter, so the two sets of sounds never coexisted as separate phonemes at the same time… and it has only three sets instead of four anyway, always lacking either voiced aspirated plosives or voiced plosives. I intend to post phonetic comparisons like that with as many other candidate langauges or language families as possible, possibly all together in a single table of present and missing phonemes. So far, I don’t know of any one language or family that stands out as clearly the best match. I think some aspects of that kind of phonetic mismatching are not so bad in some Turkic languages. That’s the biggest language family other than IE and Semitic in the relevant geographic area, and several of those languages do have online translators, but they’ve been under-represented at the main sources I’ve used so far for plant and star/constellation names… meaning not that the words I’ve seen there haven’t fit, but that I mostly haven’t seen Turkic words there to assess as fitting or not fitting at all. So I also intend to start looking up Turkic words. Those languages could turn out to be the worst matches for Voynichese of all, but at least then we’d know it. Stephen, there’s no star marking the true Pole in the south. The sort of people who would know so many southern stars would also be aware of that fact, the use of Canopus as marker, by them, being poetic and traditional, but never confused with fact. Thus, for example, the point of South on the sidereal compass used by fifteenth century Yemeni/East African pilots was named ‘the Pole of Canopus’ but everyone knew that you used the Southern Cross as pointer to the dark space which occupies the southern celestial Pole. Japanese names for stars – just for interest. Not only that word, but also several others on the same page, end with “-tn” or at least “-n” and, based on the stars & constellations they seem to refer to, have a grammatical detail in common: they’re all originally named after actions, as the person/animal/thing doing the action. If this is a Voynichese suffix that works like our “-er” and “-or”, then that not only would explain why so many words all over the book end this way, but also could be used as a guide in working out word meanings: root words that this ending is attached to should be disproportionately likely to be verbs. 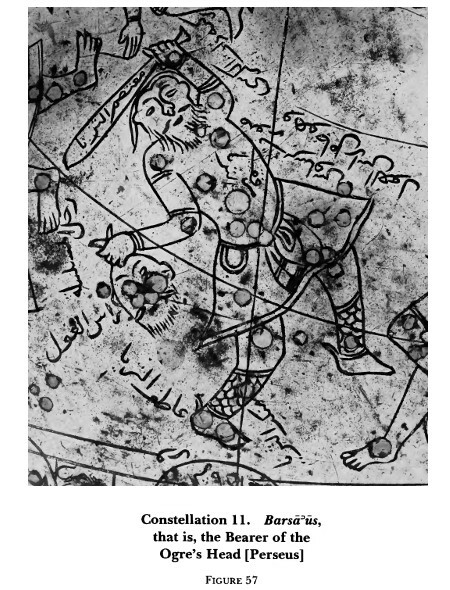 The constellation’s main star is Ghamb in Sogdian. One of its Coptic names is a compound word ending with “Gihon”. The constellation is also known as Açvini (but that’s in India, which doesn’t seem to be a source for any other Voynichese astrological names so far). The constellation, or an older one in the same place using mostly the same stars, was known as Aganna. Arktos, Arctoi, ʕgalta, Naʕash, and ʕayish are also not too far off, but Aganna is already a perfect match if you consider “agn-” alone the root word and “-tn” an unrelated Voynichese suffix. I have nothing for a name of an individual star in this area, which should be the bear’s head or front feet. Alpha Ursae Majoris is also known as Āk, meaning “eye”, but that doesn’t mean the eye of the bear; it’s a metaphor for the fact that’s the brightest, most prominent one in its area, and the star is one of the four known together as `ash in Hebrew, which I’ve identified with Voynichese item 15 “ačn”. 4 “akawšn”: must be Perseus or a star in it, based on position, but none of the names stand out for matching as well as the ones above do. 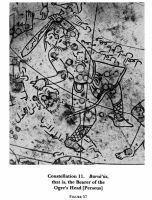 The constellation was also known as Khem, Kullāb, and Al Ghul; Alpha was also known as Chenib, Alchemb, and Al Janb; and Beta was also known as Al Ghul and Naʕir (Beta); Pi was also known as Atik and Alʕātiḳ. Also based on position, 1 “akatwšn” should be in Taurus/Pleiades, 13 (squished final letter; agnx/agn$/agnr?) should be in Leo apparently in its chest or front legs, and 19 “agar” should be in Leo’s back, belly, rump, rear legs, or tail, but I can’t report on anything special for their names yet. With 22 and 25 as Auva and Khoritos (Spica), Virgo’s torso and hands, I suspected 19 “agar” could be something in her head instead of Leo; the two constellations come so close to each other there that which one’s star would have been included in a map like 68r1 would have probably depended mostly on which one that little area’s brightest star happened to be in. So I looked up some point-&-line depictions of Virgo online to see exactly what star(s) could possibly be there. The only stars that seem to fit are Omicron and Upsilon Virginis, which are so insignificant that they aren’t even mentioned at the star-name websites I know of, so they wouldn’t be named on a two-page sky map with only a few dozen stars in it such as folio 68r. But the same drawings also showed a much more significant star just above her head and outside the constellation: Denebola. Denebola is Beta Leonis, the lion’s tail or “viscera” depending on the source describing it. Its Greek name was Ἀλκαία, Alkaia, which probably came from Arabic Al Aḳtāb or Al Ḳatab or Al Ḳalb. This would not be the first time I’ve seen the letter I read as /g/ (EVA-t) correlated with /k/ in another language; in fact there might now be enough examples of that to start finding a pattern in when foreign /k/ softens in Voynichese to /g/ and when it doesn’t. But the more interesting thing to me here is that the “ar” after it must equate to something without an /r/ in other languages: Greek “-aia” or Arabic “-alb” (or “-ta-” or “-at-“). That seems to be a new clue about the nature of Voynichese’s unusual handling of /r/ and possibly other glides. This is very interesting. Can we have somewhere a full list of these names and ideas? Black letters are my way of reading the Voynichese phonetics, which can differ from how others read it. Small marks in the black words are place-holders for Voynichese letters that I can’t link with any particular sound. Blue text shows names in known languages for what I believe are the same stars/asterisms/constellations. Very clear presentation, Derek! Thank you! Having read Stephen’s post about the statistics of star names and T H Ing’s comment, I think that a good way to compare different alternatives would be to draw comprehensive mappings of Voynichese into star names as you have done. This would make it possible to evaluate the results and see which mapping is more consistent with ancient sources. What about star #4 (EVA okoaly) “akaush(u)” as “al-Kursi” (the chair) referring to Alpha Cassiopeiae? Cassopeia was know to the Arabs as “the lady in the chair”. if the letters are encrypted form of arabic, AK must be AL cos AL is same with THE. 27. star is possibly Al-Tair. In arabic Al-Tayr that means bird. Based on the idea that 24 should be in Hercules, Corona, or Bootes, I checked for names among them that would fit. I got nowhere with Corona, but the other two did give me results with different pros & cons. 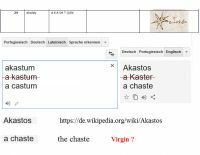 The main star in Bootes is Arcturus, which might not seem close to “akaštn” at first, but I’ve gotten used to seeing /ar/ in other languages correlating with only the letter for /a/ (EVA-O) in Voynichese plant names, and the fact that /tn/ is a common suffix so a cognate’s root word doesn’t need to have anything equivalent to it. Taking those into account would give us “ãkãš-tn”, which would predict a general model for the root of its foreign cognates as “arkars”. Unfortunately, the remaining differences between that and “Arcturus”, a dropped /t/ and a vowel conversion from /u/ to /a/, have no precedent that I know of in Voynichese. One thing this ID does have going for it compared to the following one is that it’s the name of just a star, not a constellation. Hercules (the constellation, not the character) was also once known as “Oκλάζων”, “Oklazon”, which means a worker working on his knees. Even if I hadn’t seen star 24’s Voynichese name, if I were to try to come up with a way to Voynichize “Oklazon”, the first thing I’d do is drop the /L/, and the second is try to guess at a Voynichese letter or two to put in the place of the /z/, because dropping /L/ and putting something funny in the place of /z/ are both tendencies I’m already familiar with from other Voynichese words. For that matter, the /z/ replacements I’ve seen before were EVA-L (our phonetic /š/) and an apparent digraph involving EVA-D (our phonetic /t/), so EVA-LD (otherwise phonetic /št/) would have been one of my first few guesses for the /z/ replacement here. So the word is practically a perfect match letter for letter. The main problem is that this one requires attaching a constellation’s name to just a star. I’m also now calling 26, Voynichese “akxar”, Unukalhai, also known as Alpha Serpentis. I’ve been looking at how unexpectedly high 11 still is for Vega even with the map centered around Alpha/Beta/Gamma Draconis, and even considering the idea of stars in Lyra and Cygnus somehow getting switched (and things like that have happened in star names before). It occurred to me that the issue could be not the placement of a single star but the spreading out of the whole lower-right region of the map, spacing stars (and their labels) out generally evenly fr the drawing even though in the real sky they sometimes bunch up together in certain places and leave gaps in other places. That possibility indicated an answer to the question of whether 24 was in Bootes or Hercules: with 24 as Arcturus in Bootes and a bit of spreading-out in this area, 20 is in the perfect place for Hercules. This solution for 20 and 24 would also indicate that 17 should be Aquila or its main star, Altair (Alpha Aquilae). Its Voynichese name “EVA-otchdo” comes out as “aghta” (or “ãghtã” in this case to go with the “al-” beginnings and “-ar” endings as you’ll see right below) in my phonetic expansion, or “al_ta” if we take EVA-t as /L/, even “alyta” with EVA-ch as /y,i/. Some derivatives of “aquila”, such as “eagle” and French “aigle”, replace the [q] with a [g], and I’ve seen some other words where the Voynichese letter I read as /g/ had /k/ as a counterpart in other languages. Interesting names for Alpha Aquilae alone include not just forms of “Altair” but also “Alcair”, “Alchayr”, “Alcar”, and “Açvattha”. This is not directly related to any of the above, but another that I’m ready to just throw out here while I’m at it is 23 as Coma Berenices (or one of its stars). I say that only based on what else it’s surrounded by; with Leo, Ursa Major, Virgo, and Bootes near it, there’s nothing else that would be there. It’s just a dull empty area of the sky. Other names, also used for the northern Dragon, have been Draco, Asiua, and Asuia, or Asvia… these are not Greek words, and doubtless are from Al Shuja, the Snake, transformed, as only the late mediaeval astronomical writers and their immediate successors could transform classical and Arabic terms into their Low Latin and Greek; Chilmead wrote it Alsugahh. Asuia, current in the Middle Ages and since, was from Al Shuja, and often has been written Asvia, the letter ‘u’ being incorrectly considered the early ‘v’. My idea is that EVA “ofcheor” could read something reasonably similar to “Asyoar” or “Ashyoar”. It could then be close to “Asiua”, which (like “a?yoar”) presents the rather peculiar occurrence of three consecutive vowels. #14 “ashar”: the map suggests Epsilon Leonis (Arabic “Al-Ashfar”, the Eyebrows). But could it just be a reference to the Lion constellation (Arabic “Al-Asad”)? #25 “akooatush”: if #22 is “Auva” (Delta Virginis) as suggested by Derek, #25 could be “Spica” (Alpha Virginis). Allen gives a Coptic name that seems a good match: “Khoritos” (Solitary). The Persian is also somehow similar: “Khosha” (the Ear of Wheat). Allen is a great source: he provides a huge number of different names. Basically, from the map I find the relevant constellations and then I check Allen’s corresponding page for possible matches. But I find it very difficult to discern the relevant from the accidental. …tells me that, although they do all fit together with each other, they don’t fit with Cepheus in the center. The only way Cepheus can fit with them is higher and/or to the left, with 16 being in Draco. 10 would fit; if 10 is another Draco star, 9 or 5 would work instead. 5’s name looks like “hafw” or “hafn” (depending on whether a faint streak on the page is meant to be part of the final letter), which are both comparable to some of Cepheus’s historical names. On 10 as part of Cepheus: Xi Cephei was “Al Ḳurḥaḥ”, which seems close to Voynichese “ãkoar”. But then, as with Beta Cephei, we would need an explanation for why the named star is not the brightest one around, or even in second or third place. I still figure Polaris works better, under a derivative of its Hebrew name “Kōḥābh”, or possibly a name influenced by both “Al Ḳurḥaḥ” and “Kōḥābh” (similar names, fairly close proximity). Hello Derek, I agree with your observations. I wish I had more time to help in this work. Fitting star names and positions is difficult, but what we have so far is very promising. Another problem is how much relevance to accord to non-Arabic names (such as the Khoritos for Virgo). 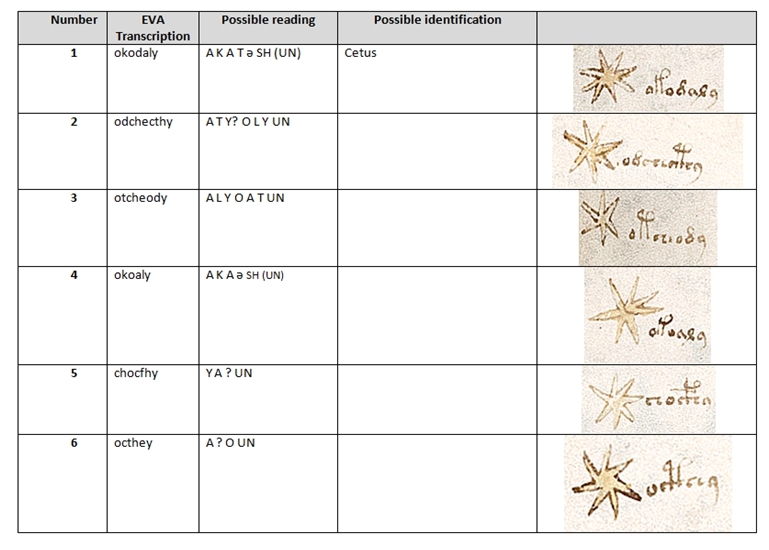 I would also be curious to know Stephen’s opinion about your proposed identification of star #11 with Vega (I agree that both the Voynich and Arabic names stand out from the others and the position on the map agrees very well with the identifications proposed by Stephen). In case that question was about my use of letters that others have not been using: there is now a separate page here on just the subject of my extra letters and why I think they are what I think they are, where you can decide for yourself how good or bad my case for them is and point out alternatives. Thanks Derek, and everyone. I find all these suggestions very useful, even if it will take us time to digest them all. Maybe what we need is an updated list with people’s suggestions included, so I will work on that… slowly! To answer Marco’s question about Vega on this page, I (like Derek in fact) am reluctant to be too firm about many of these names until we have worked more on the system and become clearer about individual letters. Steven – please could you add a page so that we can submit ideas for stars names on f68r2. In a previous posting, I suggested there was only a weak link with Arabic star names. I’m still not convinced that Arabic is the main/sole influence in the naming of VM stars. In relation to VM star names, I suggested that “they [could be] based on another non-Arabic cosmology found in the Mesopotamian/Arabian region”. My suspicion was that there could be some Gnostic/Jewish influence in VM star naming but I didn’t have any evidence to support this. I’m encouraged by Derek’s suggestion of a Hebrew named star, and also in my tentative suggestion for the Pleiades (Athyr/Hathor for EVA:odaiin) which is also a name used by Hebrew scholars. Another possible naming scheme for stars is hinted at in the “Book of Revelation” in the New Testament. This is one of more Gnostic-influenced Christian texts. It refers to “a star named Wormwood” [Revelation 8:11]. This seems to allude to the bitter qualities or influence of a celestial body. My feeling is it’s possible that there are links between plant names (or properties of a plant) and star names. These are just speculative ideas – but hopefully they cast a useful alternative perspective on possible naming schemes. Ok, I’ve added a page for f68r2, though without any text yet. I’ll add some ideas soon. Also a page for 68r3, Pleiades page with stars numbered to help discussion of star names. I found no stars with names particularly close to 15’s Voynichese name, but I did see that the prominent 4-star figure in the bear’s torso, also known as the bowl-shaped part of the Big Dipper, once had its own separate name in Hebrew: `ash. This could be related to the “arsa” you found, presuming the “bed” your quote refers to is the same four stars, which makes sense because they really do stand out from the rest. `ash is really a very close match for 15’s Voynichese name, closer than Alkaid/Alkay is, especially if Voynichese is not Semitic. That little mark at the beginning that looks like an apostrophe leaning left is how we represent a Semitic sound that non-Semitic speakers tend to find… just not worth the trouble. It sounds like a cross between a melted /g/ and maybe something related to /x/ or /h/ getting strangled by an /r/. The Greeks decided its letter in the Phoenician alphabet was wasted on it and gave that letter a whole new life as a vowel, omicron (from which omega was later derived). The bent apostrophe is really a way of just trying to ignore it. It tends to vanish from words imported into non-Semitic languages. In this word, that would leave ash. The Voynichese word is a_n, and we already know that lots of Voynichese words end with /n/ so it’s apparently a suffix, in which case the root is a_. So all we need to make this match is for that other letter, EVA-CKH, to be close enough to [sh]. And even before looking at 68r1, I had inferred from other gallows letters in plant names that this letter would probably represent /č/, which fits here just about perfectly. In an old post back in May, you recognized a similarity between the Voynich script and Phoenician, but you dismissed this idea since “Phoenician wasn’t bad graphically but it was much too ancient”. Do you think its worth revisiting this idea? Phoenician influenced a number of later scripts e.g. Proto-Hebrew, Aramaic, Greek (and others) so I think its a reasonable hypothesis that the VM-script may be distantly derived from Phoenician. I’ve done some investigating about a problem with stars 11 and 16 (the one in the middle). 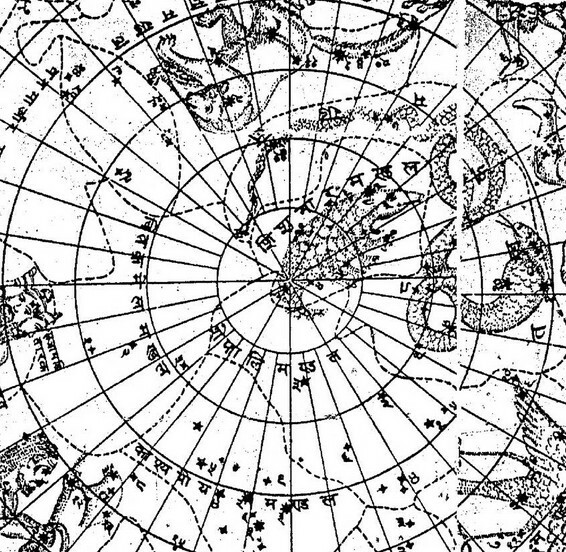 Given the orientation of other stars on 68r1 and Durer’s northern sky map, they can’t both be what they had seemed. Maybe one, but not both; either 16 is not in the center of Durer’s map but something lower and to the right (ideally in Draco’s face), or 11 is not Vega (in Lyra) but something higher and to the left (presumably in Cygnus). I looked for name matches for 11 in Cygnus that I might not have known of before, and got nothing. But in looking more closely at Draco, I did find a sign that some cultures could center their maps that far away from Durer’s center and Polaris: there have been many temples aimed at Gamma Draconis (the part of Draco’s tail that curls under its chin), over a long enough period that precession actually forced the newer ones to be oriented slightly differently from the older ones! And Alpha and Beta Draconis, in Draco’s head, are both brighter and closer to Durer’s center than Gamma is. So any of the three of them are viable candidates for star 16 which would, unlike Durer’s center up in the middle of Draco, allow 11 to be in Lyra. I see no name matches for 16 in Draco. But I’ve been expecting all along that some Voynichese star names would have no identifiable cognates elsewhere (just because any language can throw in a few unique ones), and the one they put in the center of their map might be where that’s most likely to happen. With 11 as Vega and 16 as not Durer’s center but Alpha, Beta, or Gamma Draconis, not only is the conflict fixed, but their relative positions on the map also have the side-effect of giving away 5 as Cepheus. The Voynichese name, read as “hafw” or “hafn”, is reasonably close to some of Cepheus’s historical names: Ḳifaūs, Kankaus, Fikaus, Fifaus, and Ficares. I have overlapped a mirrored image of Voynich f68r1 on a modern star map. 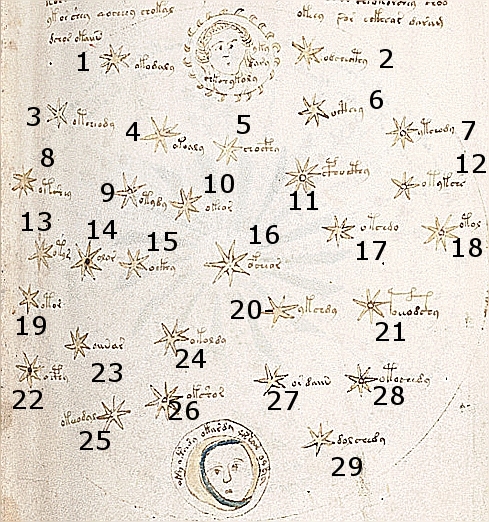 I mirrored Voynich stars because modern maps represent the sky as seen from the Earth, whereas ancient maps represented the sky as a globe seen from the outside (as in the Farnese Altlas http://en.wikipedia.org/wiki/Farnese_Atlas). The numbers correspond to Voynich star positions. Those marked in red are the ones I list below, as identified by Stephen. I added red lines to highlight their overall pattern. The outer border of the Voynich map seems to correspond to the ecliptic (the red curve on the modern map). The Sun (between stars #1 and #2) seems to roughly correspond to the Spring equinox and the Moon (between #25 and #29) to the Autumn equinox. The green dots and the green lines correspond to the actual positions of the identified stars on the modern map and the pattern they form (on that map, only “Cetus” and “Arcturus” are labeled). I had previously missed that Cetus was so close to Taurus. I keep leaving out 27 as Altair and 20 as Tashyata (i.e. Aldebaran), which do not fit this pattern. I could not identify the other two stars #16 Aphyar and #23 Auror. 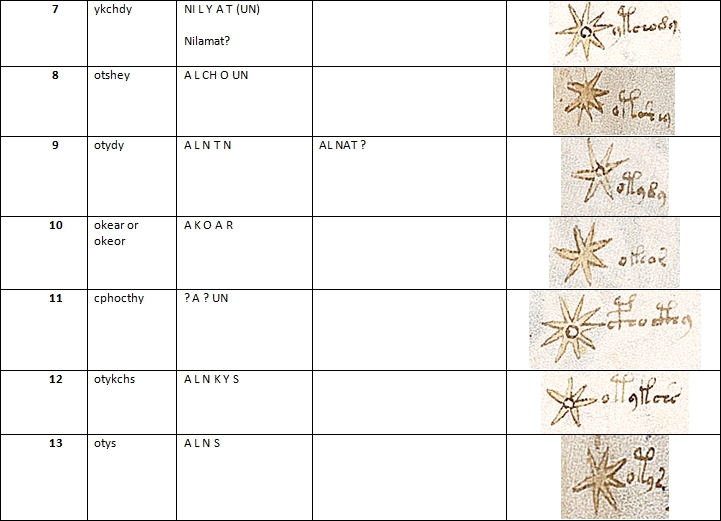 The fact that the respective positions of these six stars on the Voynich page are visually similar to the actual ones seems to suggest that this really is a map of the Northern sky, as suggested by Stephen. On the other hand, the presence of stars that do not fit (in particularly #29, whose identification based on linguistics considerations seem very sound) is problematic. Is the similarity between the two patterns coincidental? Really interesting. My proposed identifications were still tentative, but your mapping really seems to support the identifications. I didn’t expect that, as I really suspected that the positions were random! I wonder if we could now start to predict possible names from the modern map? Hello Stephen, I am glad you find the results interesting! I must say that I am very ignorant in the field of astronomy: I hope I have not made any major blunder. If these patterns can be confirmed, they certainly support your identifications. I already posted the very few new things I could infer on the basis of nearness: #8 (EVA otshey) “alchoun” as “Alcyone”. I am not sure that this makes sense on the basis of your linguistic analysis. Alcyone (the brightest of the Pleiades) as #9 Al Nat, belongs to the Taurus constellation, but it is closer to the ecliptic and more far away from Polaris. Also #11 as Vega as proposed by Derek seems to fit well with the map. #10 as Polaris would also seem to make sense from the map overlap. But matching “akour” to “Al Kaukab” seems a rather long stretch. 1. It’s not merely somewhere around the right area, but dead center, where even ink bleed-through from the centered drawing on the other side of the page puts a starburst pattern right around it. That’s right where the North Star should be on a northern hemisphere astrological map. 2. I can connect the words. I am rather certain of what Bax seems to more hesitantly suggest for the second letter, that it is /p/. For the following letter, EVA-ch, he has /y/ and I would use /h/, but either way, the rest of it is /oar/. So that gives us something like /apyoar/ or /aphoar/ or /apʰoar/. Also, I’ve seen several cases in plant names where /o/ followed by /a/ or another /o/ correlates with other languages’ words that also have /r/ in that spot, not just vowels (and it even helped me identify one more plant by sneaking in the extra [r] in my search parameters), as if the /r/ in other languages in those cases correlates with something that Voynichese treats as implied as a glide between vowels, giving us /ap*orar/. Given the fact that /r/ and /L/ are often connected to each other in language evolution, I think that’s a close enough resemblance to [Polaris]. I am hesitant about all of the attributed names at the moment! But I do think that if we keep working on them we could make headway. Perhaps we should explore other possible versions of the name? However, I hadn’t realised how clearly in the centre this star is, as you point out. On that “rather long stretch” from “Al Kaukab” to the Voynichese name for #10: you wrote the Voynichese word as “akour” here, but I see “akoar”, which is not so far from Al Kaukab’s Hebrew name, “Kōḥābh” (according to footnote 5 near the bottom of the page I’m linking below). By trying matces you can also move map ~23° — 30° from center, as in some maps ecliptic coordinates can be used in place of more frequent polar one. From the comparison with Duerer’s map, apparently Polaris (the tail of Ursa Minor) should be Star #10. Could that star (labeled “akoar” or “akour”) be identified with Beta Ursa Minor “Kochab” (or “Al Kaukab”)? Kochab is from the Arabic title that it shared with alpha (Polaris); and it perhaps was this star that the Greek astronomers called Polos, for it was near the pole 1000 years before our era. Burritt’s Atlas of 1856 has Kochah. Lots of the other names in here look pretty similar to each other, but this one stands out. And in lists of known star names, there is one that similarly stands out… and also happens to be practically a letter-for-letter match with this one, using the sound values I derived for these letters from plant names. My fleshing out of the alphabet yields “vajn” for this word, and the known star name I’m putting with it is “Vega”. It’s easy, based on precedents in various unrelated languages, to connect both the pairs a-&-e and g-&-j. (The letter I read as /j/ is even a ligature based on the one for /g/, so Voynichese readers would have literally their counterpart for the written letter [g] in there every time they read a word with the sound /j/). There are lots of Latin words ending with [a] and lots of Voynichese words ending with /n/, so even if they’re not suffixes in this case, the word’s evolution in both languages could have easily just been affected by the fact that those are ways their speakers tend to end words, so the final letters don’t really need to be connected. I’m going to try to find star maps and see whether other stars around Vega also have reasonable phonetic similarity with the ones drawn around #11 in the manuscript. the position of Star 11 fits well with that of Vega (Lyra constellation) in Duerer’s chart. I also want to suggest another possible identification: 8 (EVA otshey) “alchoun” as “Alcyone” (which, as 9 Al Nat, belongs to the Taurus constellation). I have seen that Stephen identifies 29 with “Tashyata”, which I now understand it is Tascheter i.e. Aldebaran (also in Taurus). This identification seems to invalidate the idea of taking the positions of the stars as relevant, since it implies that Taurus is at the lower right, while the other identifications seem to suggest that it is at the top left as in Duerer’s engraving. Anyway, here is an updated version of the star positions. I left out 27 (Altair?) which does not seem to fit. Apparently, the other stars are in a meaningful, if distorted, order. Stephen, I cannot understand to which stars “16 – Aphyar” and “23 – Auror” refer: I have not been able to find these star names. Could you please provide some details on these two? I am really excited by these new findings! Thank you again for sharing your progress! I’ve said before that the big sun & moon figures at the top & bottom of 68r1 & 68r2 seemed to be covering the parts of the sky where Libra & Aries belong. I’ve also said before that the right side of 68r1, especially the lower right, seems distorted, with stars pushed up and/or to the right. The placement of 29 Terāzū (Libra) so far away from 25 Khoritos and 22 Auva (both in Virgo) fits the pattern: a lower-right object, shifted out to the right and up. It appears to be be the biggest displacement so far, which could be a sign that it’s the original one that caused the others. And the area it abandons would be a strangely wide empty space between Libra and Virgo if the moon figure weren’t drawn there, which makes it look as if putting the moon figure there was the reason why Terāzū got displaced. On 68r2, the placement of the sun & moon mostly outside the area of most of the names can even be seen as a way of avoiding having the same thing happen again. My approach with “Vega” didn’t have anything to do with finding locations on a star map yet; I just looked for phonetic similarities alone, picking relatively unique-looking names to avoid getting bogged down in too many distractingly & misleadingly similar false positives. Doing the same thing again (actually even using three out of the same four letters), I found another good result: #22, Voynichese phonetic form /avn/ (EVA ocphy); traditional star name “Auva“. Notice that in addition to the similarity between /av/ and /auv/, we also have a parallel of Vega/Vajn’s difference in their final letters: /n/ in Voynichese and /a/ in the matching traditional name, both times. Once I’d spotted the match just going by phonetics, I checked its sky position, and it works again: it’s one of the brighter stars in Virgo, which is along the lower left rim of both maps. thank you very much for sharing the results of your further research! I like your rigorous methodology and I am sure that focusing on a limited number of labels and stars increases the possibilities of making progress. I had the same idea as Derek, and I have tried to place the stars you have identified on f68r1 on Duerer’s astronomical map of the Northern sky, which is astronomically reasonable accurate. 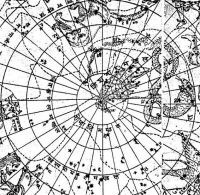 1 and 25 refer to the constellation of Cetus, which Duerer illustrates in the Southern sky, so it is not on this map. The six stars I could make sense of seem to me rather compatible with the actual positions. The only one which is considerably misplaced seems to me to be Alya (17). By the way, the overall orientation of the map is consistent with your identification of Pleiades at the top right of f68r3. My overall impression is that the stars are not placed randomly, but I am far from sure. As we already discussed, twin maps like f68r1-2 appear in other manuscripts as illustrations of the Northern and Souther sky. Also the number of “stars” (53) is rather close to that of the “classical” constellations (48). From your analysis, it seems that here we have a star for each constellation. I wonder if this is an unicum or if there are XV century star maps based on stars instead of constellations. Sorry, for star #16 I meant to suggest Alpherat/Alpheratz, or else Alphard, or maybe Alfirk. I notice that Alfirk is in Cepheus, near Draco. The most likely single star in Cepheus to be mapped among only a few dozen stars in the whole sky, as we see on f68r, is Alpha Cephei, the brightest one, whose Arabic name is Al Deramin. (The numbers you see after stars’ names in some sources are magnitudes, starting at 1 for the brightest with higher numbers for dimmer stars.) The one we call “Al Firḳ” is Beta Cephei, which is dimmer and thus wouldn’t be represented on a map that excluded the brighter Alpha… BUT according to Marco’s Richard Hinckley Allen site, the name was originally a plural (because just one animal can’t be a “flock” or “herd”) referring to Alpha, Beta, and Eta Cephei together. It didn’t come to specify Beta along until getting singularized sometime later, and that transition apparently even resulted in Alpha being called “Al Firḳ” once by mistake. So I figure #16 is Alpha Cephei, the brightest thing in that area, going by a name related to “Al Firḳ”, but not the star now known as “Al Firḳ” (Beta Cephei). Actually, I was not able to find Al-Firk in this catalogue, but I think it is interesting to have a look at it. I have found this interesting and well illustrated book: “Islamicate Celestial Globes” by Emilie Savage-Smith. This differs from Prof.Bax’s proposed attribution of Altair. The star referred to as Tashyata (29) seems similar to the Persian star “Taschter” for Sirius. It seems likely that the other Royal Stars might appear on this chart. Its not clear if the stars shown on pages f67r1/f67r2 are symbolic groupings or not. The stars on f67r2 seem to be more of a symbolic grouping as indicated by the ring of stars around the edges. There seems to be a number of similarly spelt adjacent stars, possibly indicating some kind of pairing. This might give a clue to their identity. This might indicate some kind of gender-pairing or asterism? The stars numbered 13/14/15 seem to form an asterism. Given that stars 28/29 are so similarly named, I find unlikely one could be Al-Yad and the other Tashyata. Other information that would be useful in the table is the number of occurrences elsewhere in the VM for each star-name. Many only appear once, but others much more frequently. Again, this might give a clue to their identity. Thanks Darren… and I am working on your last point… slowly! Have you compared your predicted matches with modern sky maps? If two star matches are established, that establishes the angle and scale of the Voynich star map, and then every other star’s identity on the same folio is immediately inevitable just based on distance and angle from those two. I haven’t done that as I suspect the stars are placed randomly… but I could be wrong. I wonder if f68r1 is meant to be southern hemisphere and f68r2 northern hemisphere, or vice versa? Hinkley-Allen is the most comprehensive text, still, in English but it has to be used in conjunction with works by more recent scholars, to compensate for certain errors, particularly in relation to the western versions of Arabic star-names. 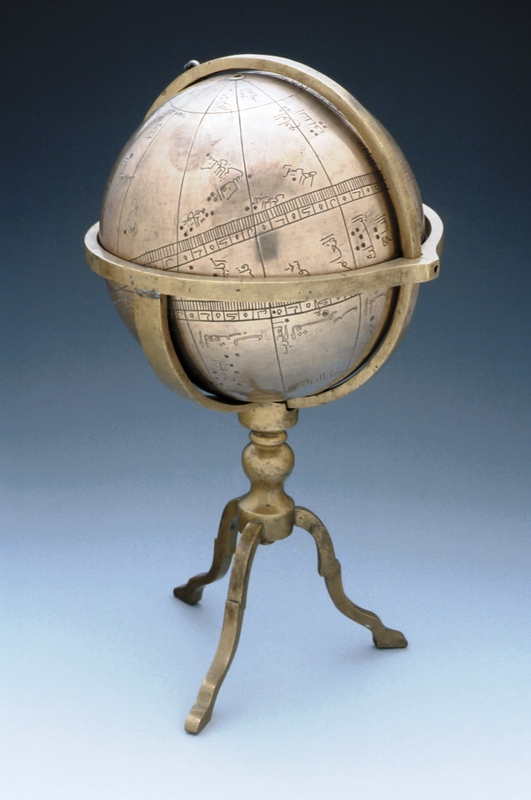 I have always recommended Emilie Savage-Smith’s Islamicate Celestial Globes as a careful and conservative source for such things as the Islamic lunar mansions and for the correct romanisation of Arabic names. 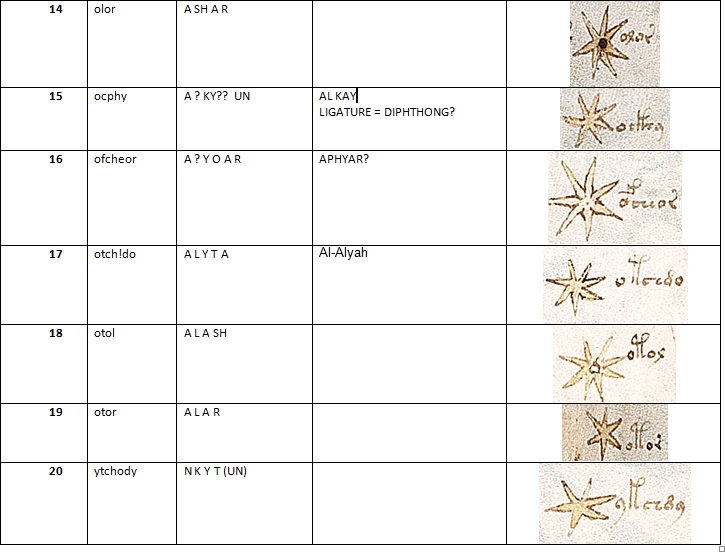 The ‘Arabic’ star names are not always Arabic, and rarely reflect the pre-Islamic star-lore of the Arabs; in fact the ‘Arab’ names are often translations of the Greek, Latin or Syriac. In some cases e.g. Al-Gabbar for Orion, the Syriac is simply transliterated to produce the ‘Arabic’ name, and was not translated. In other cases e.g. Thurayya for the Pleiades, the name came into Arabic from southern India – so long ago that memory of its foreign origin was forgotten and a local etymology invented to explain it. Also, I think it is important to keep precession in mind. If a map shows Draco as the Pole star it comes from a pre-Christian (and therefore also a pre-Islamic) source, and is highly unlikely to contain any star-names in Arabic. During the Greek and Roman classical period use of Polaris to mark the pole was a practice limited to the Phoenicians and some very few late-classical astronomers. The Latin classical texts – such as Manilius – say that the Roman world was happy to keep taking Ursa Major as the Pole constellation, as it had become when Draco fell from that position. Taking Polaris as the Pole star only becomes the norm from about the time of the renaissance. At the same time, there are still proverbs current among the Bedu which maintain memory of Draco’s fall, and the consequent movement of Canopus. Alruccabah; Cynosura; Phoenice; Lodestar; Pole Star; Tramontana; Angel Stern; Navigatoria; Star of Arcady; Yilduz; Mismar. I’d strongly recommend that star-names are considered from older and less sedentary traditions, including the colloquial descriptions found among Yemeni mariners, and the various forms of lunar agricultural calendars, fairly well documented for the Yemen at least: see Serjeant, and Varisco on the last.